Dolphin Cove is an adult condominium community located in Brigantine’s prestigious south shore. The complex has 280 one and two bedroom units ranging in size from 560 SF to 980 SF. Residents of the community are a mix of full-time owners, summer owners, and full-time tenants. Dolphin Cove is a peaceful retreat – the community’s bylaws prohibit weekly, bi-weekly and summer rentals. Heat and Hot Water: Our buildings have centralized heat and hot water, and our owners never worry about gas bills or repairing costly boilers or hot water heaters. Swimming Pool: Our pool always has a certified lifeguard on duty, and the pool is open weekends starting Memorial Day. From July 4th through Labor Day, the pool is open daily. Tennis Courts: Our more nimble residents enjoy playing on our 2 tennis courts. Dish Network: All units enjoy free access to Dish Network. This saves our unit owners upwards of $100/month. Dolphin Cove’s residents enjoy the best of both worlds. The complex is 400 yards from the white sugar sands of the Jersey Shore’s most beautiful beach. 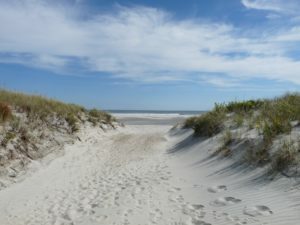 Brigantine’s south end beaches are protected by 300 yards of protected wildlife area. Foxes, Snowy Egrets and the occasional Blue Heron put in appearances. Dolphin Cove is also 800 yards from the tranquil waters of the Atlantic City Inlet. Whether you are looking for the surf of the Atlantic or calm waters for small children, Dolphin Cove is just steps from either. If you’re looking for nightlife, Atlantic City’s fabulous boardwalk, restaurants and casinos are just minutes away.